Outlook 2013 or later / Outlook Online, MiniCRM subscription (or trial). Only those users are allowed to perform the settings who are global admins in Office 365. Log into Outlook by using your Office 365 account: https://outlook.office365.com. Click on the Admin settings, then on the Exchange [1.1.] option. Choose the organization > apps option [1.2.]. Click on the New (plus) icon [1.3.] and select the Add from URL option. After saving, go back to Outlook, click on an email, then on the MiniCRM caption. Connect the Office 365 account with the MiniCRM account [1.6.]. Accept the terms in the window that appears. After that, the MiniCRM login page appears (only displayed now, after connecting you will be logged into MiniCRM automatically). The Office 365 account will be connected to the MiniCRM account given here. 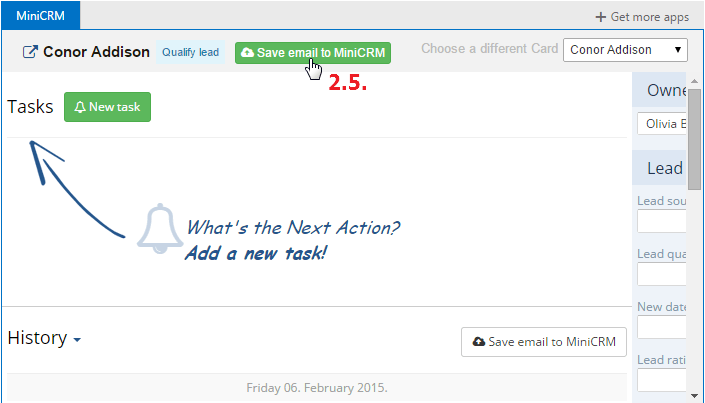 If MiniCRM is already integrated with Outlook, the MiniCRM caption is shown in email messages [2.1.]. If you click on the MiniCRM caption and select a module [2.2. 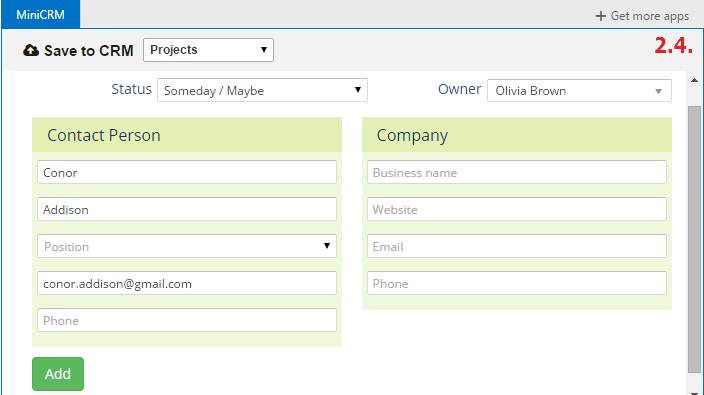 ], the application is searching for cards based on data collected from the email (sender, recipient etc.). The most relevant one will be displayed. If more cards are found, you can choose one from the dropdown list [2.3.]. The card shown looks the same as the one in MiniCRM. Every function of the system (editing tasks, modifying cards, sending messages etc.) is available here except for customization. If no card is found, you can add a new one [2.4.] by selecting a module. The fields of the new card is filled out automatically with data collected from the email (first and last name, email address). You can enter more data as well. 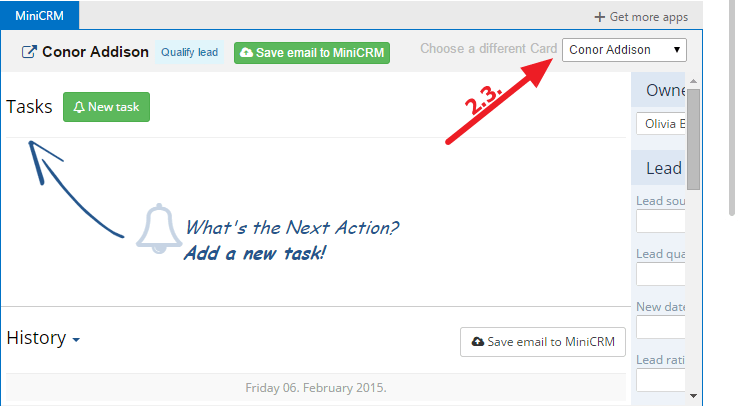 If you click on the Save email to MiniCRM button [2.5. ], the relevant card will be identified based on the email address and the email will be saved to History of the relevant card.